Are canvas kayaks easily punctured? Definitely not. Many new canvas kayak paddlers fear the day when a sharp rock under the water will suddenly make a huge serration in their kayak. This normally doesn't happen. 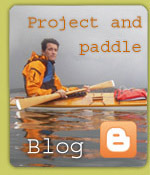 Many years use and rough treatment of kayaks show that there is no reason to worry. First of all, there are few sharp rocks along the cost. Most rocks are smoothed by the continuous polishing by the wave action â€“ the exception being rock that has recently been quarried. I often bump into rocks when paddling among isles and skerries, and the canvas isn't harmed in the least. Second, the canvas is very resilient. It's stretched out over a frame of stringers and ribs, which make it flex if it meets a rock. This gives the kayak a great deal of strength compared to kayaks made from less flexible materials. This is also mentioned by several people in the references section referanser. If the kayak gets punctured, is it difficult to repair? You can easily repair it temporarily by patching the hole with duct tape. For safety reasons, you should always have some tape in the kayak. More permanent reparations are also simple to carry out. You can glue on a patch from the inside, or sew the canvas together, apply putty, and then paint and sand until the repair is no longer visible.